If your marketing is struggling to perform, a well-constructed customer journey map can help. It’s easy for marketers to grind away creating content and marketing campaigns that fail to resonate with your target audience. Customer journey maps help identify points of friction for customers, then find ways to resolve those points of friction. We created our own template of a customer journey map to use in-house. In this article, we'll walk through the steps of completing the customer journey map using buyer personas. For the newbies, here's a quick explanation: a customer journey map (CJM) is a grid that outlines the experience of one persona. For this article, we'll use a fictional persona to explain the process and purpose of the CJM. If your brand has three customer personas, each will have different problems to solve. Throughout the template, walk through their process. From start to finish, solve the particular problem. Capture their thoughts, motivations, questions, and feelings at every stage. When you finish the map, you will see where your current customer experience is working and where improvements can be made. Before creating a single customer journey map, get your buyer personas in order. Creating accurate personas is crucial to creating a map that reflects reality. 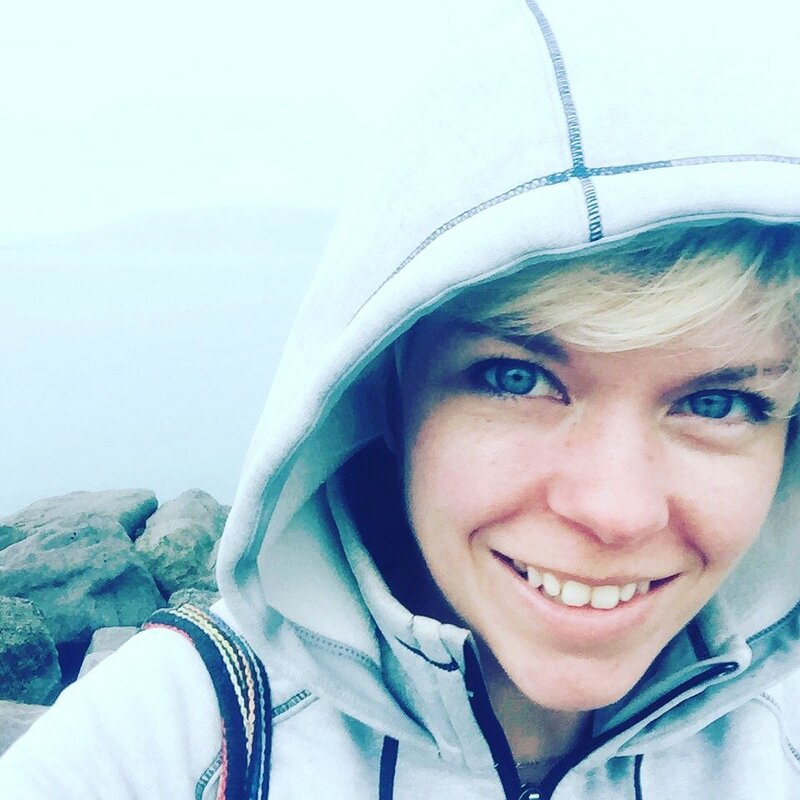 Haven’t created any personas yet? That's fine. Stop here, and read how to build customer personas. At the bottom of that post, you’ll find a download link to a strategy kit, which gives you some templates to use. 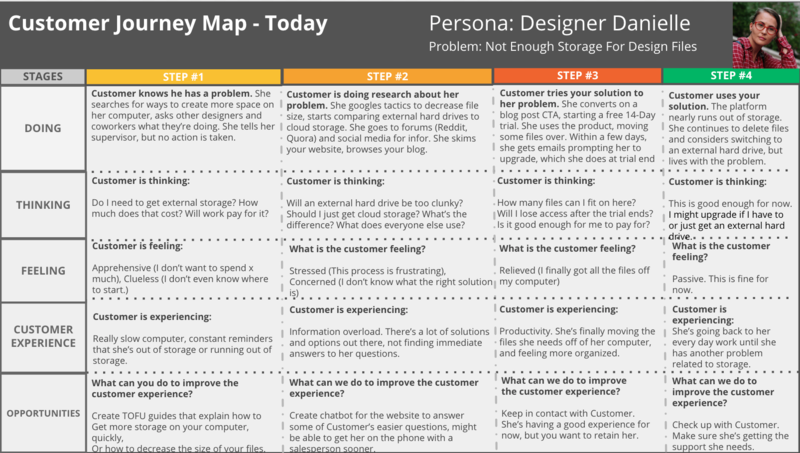 You should refresh personas before starting the customer journey map. As people and their expectations evolve and change, so do your personas. So, you want to make sure your buyer personas are accurate before using them to craft the map. Before filling out a customer journey map, decide which persona you're going to use first, and the problem you want to help them solve. Let's say our persona is a designer, Danielle. Danielle has a problem: She's looking for extra storage for her design files. The first objective is to craft an accurate story about Danielle, and her problem. What is the persona's primary goal? To get more storage for her design files. What's her budget? You don't need to know an exact number, but a range helps. What are your personas specific problems? She is experiencing issues with saving work or creating multiple file sizes. As a result, she lacks efficiency in her work. 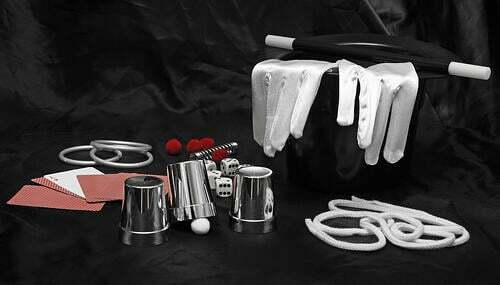 What happens if your persona does not solve her problem? If she doesn't solve her problem, Danielle must delete design files and find temporary solutions to solve her storage issue. 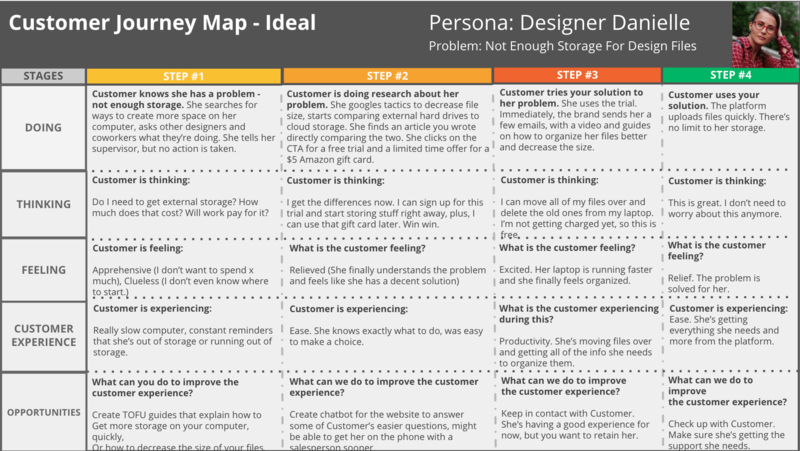 Once you have a persona and a solid story, you can start filling out the customer journey map. Follow the map (linked) as a template. For each persona, we suggest making two maps, each one serving a different purpose. The current customer experience. Everything the customer goes through right now to solve a specific problem. Whatever the problem, you need to choose one scenario, one persona for each map and accurately map out their journey all the way through. The ideal customer experience. The ideal customer experience also walks through a specific scenario for each persona, but in this map, you identify the best possible experience a customer could have, from start to finish. For both maps, you'll put yourself in the customer's shoes. So, every step will be from the persona’s point of view. Start with the current experience and get that outlined before working on the ideal experience. The more specific and truthful you are, the better. Companies who see their service offering through rose-colored glasses will fail in this process. The customer journey map is not about positioning your service in a positive light, it’s about identifying the reality from the persona’s perspective. Getting this right is key to revealing anything of value from a customer journey map. As you answer questions for personas such as Danielle, don't go off assumptions. Take info from the customers you already have, and use that data as a baseline. Dig into the performance of the marketing materials and touchpoints that currently facilitate your customers moving from point-A to point-B. Marketing assets (content offers, landing pages, emails, etc.) with low clicks or conversion rates can reveal potential points of friction. In our example of Danielle, if she downloads a Middle-of-Funnel offer about cloud storage benefits, but has a significant delay before purchasing, the issue may not be anything to do with your marketing or website. You may discover that the Danielle persona has to jump through a few hoops to convince her employer to pay for your solution. With this insight, you can brainstorm better content offers, and provide better support and follow-up, to give her the information she needs to move forward. Let's imagine another persona for a moment. CEO Jake decides to take action on a problem: all of the designers are complaining about not having enough storage on their computers. Jack reaches out to your company about pricing for his all of his employees. He feels pressure from the team, so he wants to make a decision as soon as possible. A representative follows up with him a few hours later via email, then by phone. By zooming in on a specific scenario and individual, you can look for gaps. In this case, maybe the waiting period between Jake filling out a form and getting a reply was too long. Or, he may prefer not to be contacted by phone. Through this exercise, by including possible negative experiences, you can learn much more about your customer. Improving the customer experience requires a deep understanding of your buyer personas. After completing the customer journey mapping exercise, you walk away with actionable ways to enhance the overall brand experience for every persona. The key to a valuable customer journey map is real data. Assumptions will not work. The journey must be based on reality. This means possibly interviewing your current customers that match your target buyer personas. Ask them their honest experiences, and don’t try to justify any negatives. The negatives in their experience with your brand are the most valuable pieces of information you can glean from these interviews. Another way to get experience data is in examining the metrics and analytics of your marketing performance. With a tool like HubSpot, you can get in-depth insight on how your personas are interacting with your content, which pieces perform well and drive customers, and which areas are causing friction to the buyer journey. No matter which tools you use, creating a customer journey map is guaranteed to give your team insights on how they can better facilitate the buyer’s journey, and remove friction from the sales process.